Stairlifts: Stairlifts in Leicester including all Leicestershire, with Loughborough, Hinckley, Leicester itself, Coalville and Melton Mowbray too! Stairlifts in Leicester including all Leicestershire, with Loughborough, Hinckley, Leicester itself, Coalville and Melton Mowbray too! Castle Comfort Stairlifts offers top brand stairlifts, keen prices and fast installs for all those seeking stairlifts in Leicester or Leicestershire. 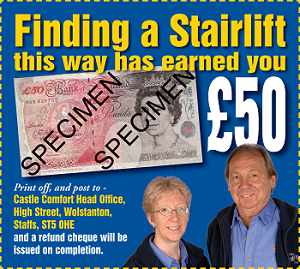 Give us a call today by going direct to our Leicester stairlifts surveyor on 0116 202 9866. If however, you are looking for fascinating facts about the area then feel free to read on. Leicestershire is an inland county bordered by 7 other East and West Midlands counties. First mentioned in the Domesday book the county takes its name from Leicester the county town. Leicester is the site of an ancient roman fortified town and relics of roman baths and walkways have been found beneath it. In the industrial revolution its factories were skilled in engineering, producing shoes and also hosiery. The towns industries have always been boosted by immigration to work in it's businesses and the city has the largest Caribbean Carnival outside London and also the largest Diwali celebration outside India. Also known for it's University where Sir Richard Attenbourough, the famous wildlife film-maker, grew up. Called the sport capital of the UK it has Championship side Leicester City Football Club, Leicester Tigers Rugby Union Club - and of course Leicestershire County Cricket team. Stoke on Trent (the home HQ of Castle Comfort Stairlifts) and Leicester have a lot in common. Their soccer teams, Stoke City and Leicester City have enjoyed the services of two of the greatest goalkeepers the world has ever known - Gordon Banks and Peter Shilton. See our stairlift cartoon with Peter Shilton here getting his own back on Diego Maradona for that infamous 'hand of God' goal. And believe it or not, Keith the founder of Castle Stairlifts uses the services of his friend 'Diegito' when visiting Argentina. See here an Englishman and an Argentine with the Falklands and football very much forgotten! Leicester was also the home of the person responsible for setting up this now national stairlifts company. Robin Linnell of Acorn Stairlifts, many years ago, persuaded the Castle Comfort homecare products specialists to get serious about expansion. Robin's efforts and help, despite poor health, ensured that the Stoke based firm would go from stength to strength. Robin has now sadly left us, but in accordance with his beliefs - is still here - with other absent friends. His succesor, Richard Roemer of Acorn was challenged to be a satisfactory 'half as good at his job as Robin' but has in fact exceeded well beyond that. Richard, also of Leicester, is a staunch follower of Leicester City and is often seen at the "Walkers Stadium" when not working. Loughborough is known for it's university that is well ranked in the UK and was actually voted University of the Year 2008/9 by the Sunday Times. David Neilson, Coronation Street actor is from here. Just like our own Stairlift Stephen he is a keen charity runner who I once saw take part in a race at Stoke-on-Trent's Trentham Gardens, where the HQ of Castle Comfort Stairlifts makes its home. It is also the site of the world's largest bell foundry having been responsible for making both the bells for St.Pauls Cathedral and also York Minster. Ding dong! Hinckley is located in the south west of Leicestershire and like Leicester is famous for it's engineering and hosiery manufacturing. It has the headquarters of Triumph, the classic motorbike firm ridden by many celebrities including Tom Cruise and George Clooney. Concerning hosiery, in its heyday it was estimated there were upto 6000 people making stockings in the town! Melton Mowbray if not famous throughout the world is certainly known in England for it's pork pies. Its pies are now protected by an EEC ruling like that applied to Champagne in France. If it is not produced in the area you cannot put Melton Mowbray on it or call it by that name. It is also known for the Stilton cheese produced here and the town calls itself the "Rural Capital of Food." Market Harborough is known for being the birthplace of Thomas Cook the founder of the package tour company. In fact the world's first package tour which he organised was to the sunny climate of Loughborough previously mentioned above! What do you mean Stephen - GET fat? We have already got you down for a Bruno 30 stone limit stairlft when you stop running at 95! why did the two crisps (who did not need a stairlift) cross the road in leicester ? How many stairlifts have you installed in Leicester? Your counter on the website is fascinating but how on earth can you calculate how many of these mobility products are in particular town or city? What Castle Comfort seems to do is make it so easy for people to stay independent. clearly a lot of folk in Leicester have found this out by investing in stairlifts. They do a grand job. To answer your question we worked out how many stairlifts were currently installed each year, and an algorithm was made to track the population change of the UK against the number of stairlifts installed. If we divide the population of the city in this case Leicester by the UK population we then get a percentage which we apply to the stairlift figure to give an approximation as to how many stairlifts are installed in Leicester. I took a look at your counter. I have never seen anything quite like that on any stairlifts website. Does it give a pretty accurate figure for Leicester? It is unique, we believe, for a stairlifts website. An algorithm was made to track the population changes of the country versus the number of stairlifts installed. If we divide the population of a city (in this case Leicester) by the UK population we then get a percentage which we apply to the stairlift figure to give an approximation as to how many stairlifts are installed there. We stress it is approximate, as with so many stairlift suppliers it would be impossible without the cooperation of all of them, to more exact. 1 - Is it possible to install stairlifts on curved sections? 2 - Have the Stairlifts a grip safety system? 3 - Do I need some kind of temporary maintenance of the stairlift? Re Eddie's recent question addressing the subject of safety and stairlifts. A detailed response addressing safety in general for our products will follow shortly as the subject has been in the news quite a lot recently. Keith Castle Comfort Stairlifts covering Leicester. To most people, the expression ‘going up in the world’ usually applies to personal ambition. It may imply promotion at work, financial enhancement or steps up the social ladder. For others, with impaired mobility, going up in the world can literarily mean the ability to move safely up and down stairs from one level of the house to another. Falls in the home, especially on stairs, account for a large proportion of injuries or even deaths each year. When restricted mobility, or breathing difficulties, makes climbing and descending stairs not just a struggle, but a very real hazard, tens of thousands of people benefit from the installation of a stairlift. I have experienced the trauma felt by an elder member of my family, following a simple fall, resulting in a seriously broken leg. She lives on her own and we all knew that a difficult staircase was going to present a worry. 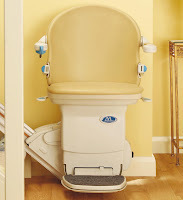 The gentle suggestion that a stairlift may be a good idea, resulted in this question - ‘Are stairlifts safe?’ Never having had cause to think about such an issue, I decided to try to find the answer so that I could offer some informed opinion. Statistically, the answer is yes, they are, provided that some obvious conditions are applied. As with any mechanical device, from an aircraft to a tin-opener, freak accidents can and do occur. The incidence of accidents involving stairlifts, seen against the number of installations, happily seems to be very rare indeed. The horrific fact is that such accidents which have happened were probably avoidable, had the correct procedures and safe-guards been applied. Stairlifts are safe but, as with any equipment, the rules must be stringently applied by both the industry and the user. Manufacturers and suppliers cannot legislate for what happens once the equipment is installed and in the hands of the user. It is essential to buy the right quality product from an experienced and reliable supplier, with an expert maintenance and service engineer on hand locally for a quick response to any problem. The dearest or the cheapest are not necessarily the best; there is no such thing as a ‘free-lunch’ where safety is the primary issue. Let us take an analytical look at some accidents which have appeared in the headlines implicating stairlifts. In Stoke-on-Trent, only an hour´s drive from Leicester, a stairlift owner tragically died in an avoidable accident on the stairs. The lady, who was only fifty-five, was found dead by her daughter, an appalling experience for anyone and she has my sympathy. It seems that her mother had fallen, resulting in her head becoming trapped between the wall and the stirlift rail. The headline could have implied that somehow the stairlift was a factor in the accident, but this was not the case. An inquest was told that In spite of her severe physical problems, the lady never used the stairlift and walked on the stairs, having expressed the fear that she would lose the use of her legs. Clearly, her stairlift was not to blame. Had she used the lift, the accident may not have happened. With the greatest of respect, it has to be noted that she had been in the habit of the regular excessive consumption of alcohol. The coroner ruled that to be a factor in the accident, not the stairlift. Tragically the result was the instant death of a six year old boy who was playing on a stairlift whilst visiting the home of his great-grandmother. 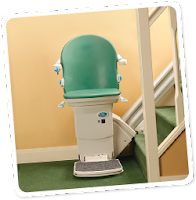 All stairlifts have a key to immobilise the motor and when children are in the house it is essential that the stairlift cannot be activated, Children must never be allowed to play on a lift as if it is something akin to a ride at a fun fair. Currently, U-Tube is carrying a clip entitled ‘Lads mucking about on a stairlift’. The ‘humour’ appears to be a shot of one guy falling off. These idiots are actually young adults! Stairlifts are not designed for ‘mucking about’. This accident was the direct result of faulty installation by someone who had no idea how to carry out the work. It seems that the boy’s uncle had removed the stairlift from another house and installed it in the new location with no professional assistance or even a manual. In the original installation, the equipment was installed on left side of the stairs. In the new location it was installed on the right. This meant that the obstruction contact strip, an essential safety device, was rendered inoperative. A consultant forensic engineer told the inquest that some of the safety devices were not working properly – “If they had been, we would not be here today.” The boy’s head was pressing against trips which meant that the lift could not reverse and free him. This was another tragedy which could have been avoided by simple common sense. The next example was the failure of the equipment but as a result of other possible factors. The report recorded that an inquest was told that a great-grandmother died in hospital just three days after being catapulted 20ft down the stairs in her home in Barnsley by a faulty stairlift. The lady was spun round in the chair and tipped out headfirst after restraining bolts on the seat sheared off. Her family told a hearing in Sheffield that they had reported a ‘whining noise’ and ‘juddering’ with the mechanism a week earlier but the company maintaining the stairlift had not sent out an engineer. The lady’s grand-daughter told the inquest that she was putting the seat belt round her gran, but, before she could do it, the chair swung round and tipped her over, causing her to fall down the stairs from top to bottom. Police attended and were of the opinion that the stairs gradient was too steep for the type of lift. There was evidence of more than five years wear and tear on the machine which had been installed as new in July 2006. An engineer who carried out an inspection after the accident confirmed two of the retaining screws on the seat had sheared off. He also believed that the seat belt had not been regularly used. The inquest heard that Barnsley Council had awarded the contract to a company to supply and fit stairlifts. However, the company had sub-contracted the installation and maintenance to another firm. Two independent experts told the hearing the seat belt failed but they disagreed as to whether it was the design or the fitting. A director of the company told the court that after the tragedy they had contacted all users of stairlifts on their books and had removed all seat belts and put new ones on which were tightened up. I am not qualified to make, nor do I make any judgement, implied or otherwise. The facts are those from the inquest, as reported in the Daily Mail article. Both companies named in the press are currently trading on the internet. My conclusion – Yes, but follow the key points. Follow the rules and you will be ‘going up in the world’ safely and with confidence. So Eddie, your questions have been partly answered - or at least we addressed the safety issue and your relative in Leicestershire can be reasured. Your other points, will be answered as soon as possible. When asked what he was doing he explained that he was carrying out an elf and safety inspection!